Annette...you slacker!! Too bad you have absolutely nothing going on in your life!! 😊 For someone having trouble kick starting the ol' Mojo, your tag turned out beautifully! I love Tim's industrial stickers, too. Great background, too! I agree with Candy...lol! You definitely had me at the red! LOVE the nested frameworks too with the green poking out! Gorgeous gorgeous tag! I love how the butterfly is front and center on your red (fave color!) tag! You can never go wrong going with what you already have! My mojo had been giving trouble lately too. So glad you stuck with it - this is gorgeous! Oh, this is gorgeous! In love with that background. Annette your tag is lovely. Love the red and how it all came together and love all the added little touches that really set the background off. So glad you stuck with it....because the final project is gorgeous...love the hints of green behind the frame works. That compliment really sets it, and the whole tag off. Thanks for sharing your process with us. 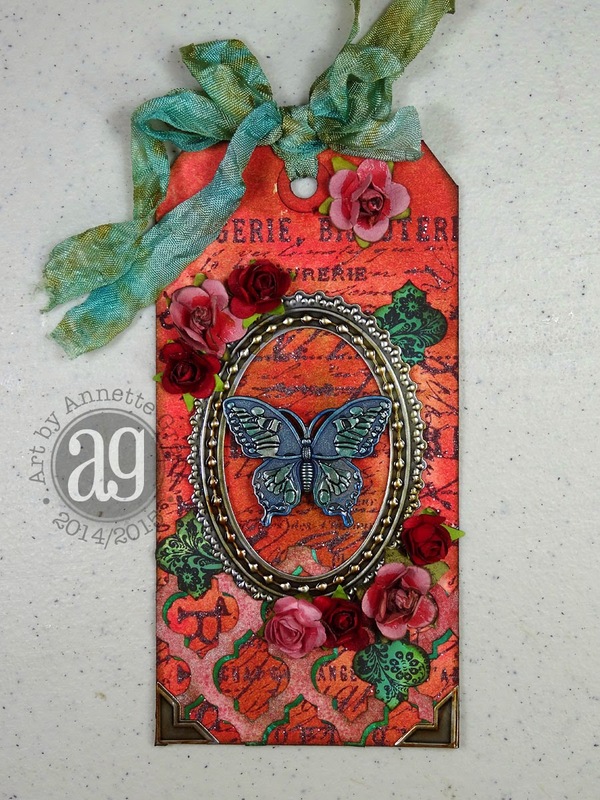 Wow this tag is gorgeous Annette! It really is, and for something that originally just started from a few mixed colors of ink laying on a craft sheet, it really made for a gorgeous base for this masterpiece. I love it! This is fabulous - I haven't tried the industrial stickers but they look super and I like the way you have layered the framework diecuts. Lucky trash can - seems everything you do is good. BUT, this one is gorgeous - the colors fly up and smack me and the butterfly is so pretty! I love looking at this one. This is gorgeous! Colors work out beautifully in the design. 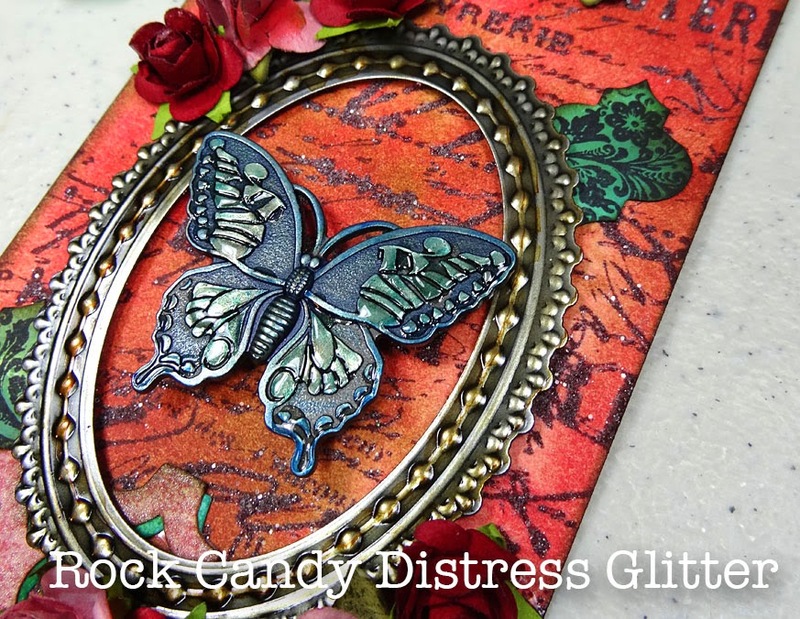 Beautiful, love your background and distress glitter, the red coloring is gorgeous.I seem to love the industrial stickers more every time I use them. G.O.R.G.E.O.U.S!!! I love the colors and anything butterfly of course. Simple, elegant and beautiful! I love the tag .. the background turned out amazing !! The framed butterfly add's the perfect focal point to this tag. I love it !!! really a beautiful tag with a perfect butterfly in frame! LOL I know about those don't want to waste tags ... I've got some of those ! This is BEAUTIFUL , love the color and that background print... glittery awesome ! So love the industrial sticker frame too, what a great idea ! Love that warm background, the distress rock candy glitter has a different beautiful sparkle on the red!! Your tag is a Stunner!! I love everything about it, especially the offset of the lattice.. what a cool idea. And sorry to say I'm glad you had a failed attempt too; makes me feel normal! LOL! Gorgeous, Annette. I LOVE that you used that text stamp for this technique, great choice. And you're right, the industrial stickers are awesome, so striking on your valentine here. Lovely work, girl. 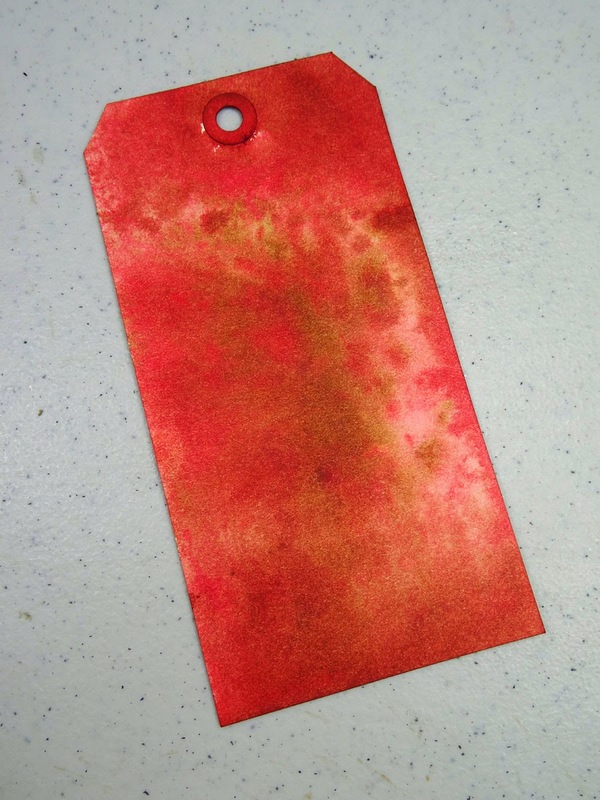 Annette, this tag turned out so beautifully! The colors are amazing! 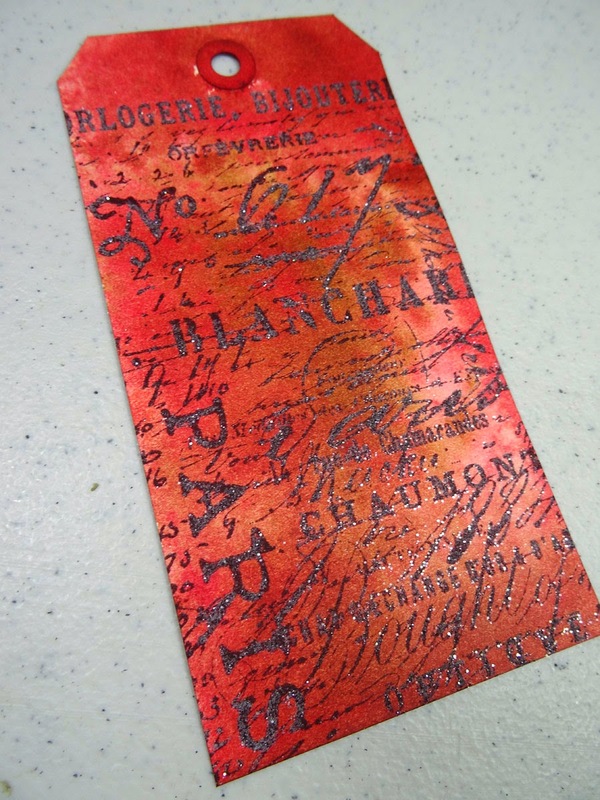 I wish I had that background stamp now - I think that will be the next one on my list to buy! I love those Industrial stickers too - it looks so awesome on that tag! Well, I'm certainly glad you didn't throw in the towel! This tag of yours is amazing! 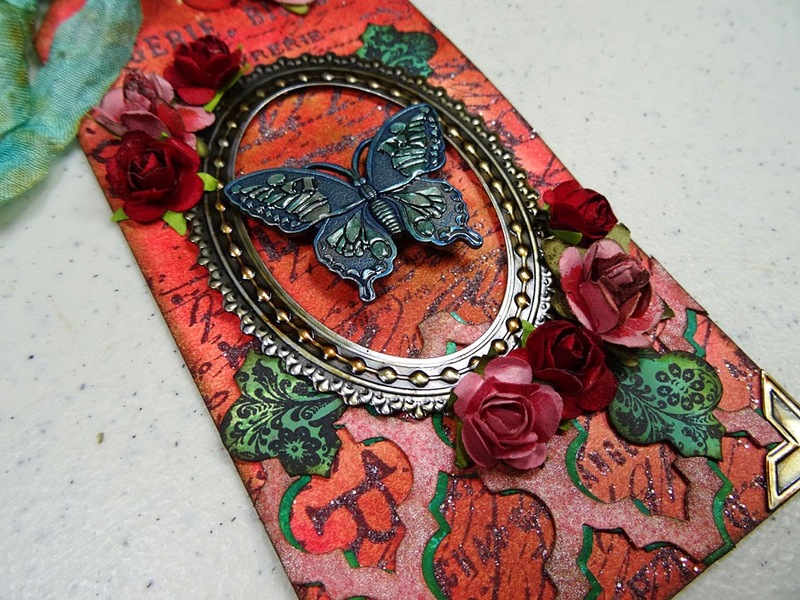 You did a great job with your background, but all those embellishments just make this tag fantastic to look at! Love the frameworks shadow idea..I'm so borrowing that! But everything together is just beautiful! What a beauty! Love the framing and the frameworks. Super tag! WOW! Amazing! Thanks for including the shot of the background after the technique and before the embellishing. Tim's glitter is so gorgeous but photos just don't do it justice. I love your tag. The colors are gorgeous and so many beautiful details. Think I'll go take another look! Ah yes, the attempts that get discarded because there simply is NO WAY bits can be recycled! That has been my fate the last two challenges! But you pulled it off! That background is fab! Stunning tag! Beautiful! The colors are perfect! This is so pretty. I love the doubled die cut on the bottom. The colors are yummy. Annette, Your tag is stunning! The colors are so rich and there is an elegant feel about. I love how you used the rock candy glitter on the background. Beautiful! Such an elegant tag! So beautiful. Striking color combinations too! Love your rock candy glitter background! A beautiful combination of everything, I love it! For someone with creative block you certainly rocked this challenge. A very stylish creation indeed. Oh what a stunner! Love that this started as a mop up tag. The distress glitter background is amazing. Love that stamp. Absolutely gorgeous. Love those deep reds mixed with metallic elements. This tag is stunning!! your mojo came back !! Love how your did that butterfly and used the framelet. Hi Annette - LOVE your use of the frame and diecut - really beautiful. Happy Valentines Day! Gorgeous! I love how you framed the butterfly Annette. Beautiful background too! This is absolutely beautiful!! I really love it!